About this Business Card Magnifier:These magnifiers are credit card or business card size to fit in your wallet, purse or pocketMagnification is 3x for an optimized magnifying glass. NOTE: Product comes with Prop 65 warning label when shipped to California. Label reads: "WARNING: This product may contain carcinogen, which is known to the State of California to cause cancer. For more information, go to www.P65Warnings.ca.gov. About this Plastic Lens Black Handle Magnifying Glass: This magnifying glass magnifies up to 3X. It features a black handle and plastic lens. These magnifiers come packed in an individual poly bag. Makes a great giveaway for environmental groups, insurance agencies, retirement communities, private investigators and more NOTE: Product comes with Prop 65 warning label when shipped to California. Label reads: "WARNING: This product may contain carcinogen, which is known to the State of California to cause cancer. For more information, go to www.P65Warnings.ca.gov. About this Magnifier Bookmark Ruler With Ribbon:This 3-in-1 promotional product features a bookmark design with magnifier and ruler functionalityThe metric ruler measures up to 6" while the magnifier has a 4X magnificationAn ideal promotional product for educational institutions, these magnifiers would also be perfect for schools, retirement communities and hospitalsChoose from blue, red or white ribbon and have your company name or logo printed on on the top NOTE: Product comes with Prop 65 warning label when shipped to California. Label reads: "WARNING: This product may contain carcinogen, which is known to the State of California to cause cancer. For more information, go to www.P65Warnings.ca.gov. About this Large Magnifier with Compass:Magnify your businesses marketing potential with this dual magnifying glass with 3x magnification and small 8x magnification. Your clients will truly appreciate the benefits of receiving this promotional gift imprinted with your company name and logo.Products are not intended for use by children or pets. They may present a choking hazard to children under 3 years of age.Special Instructions:Rush order: Information received after 12 noon Pacific Time will cause the order to move to the next day production. About this Plastic 12 Ruler With Magnifying Glass:Plastic 12" Ruler With Magnifying Glass.NOTICE: This item contains required information to be imprinted by federal law. Required information is not optional and may not be removed. We thank you for your understanding.Special Instructions:Rush Service:Catalog Quantities Only.One Color And One Location. About this Slide Out Magnifier with Light:Plastic slide out magnifier with bright LED light when open.Batteries included. NOTE: Product comes with Prop 65 warning label. Label reads: "WARNING: This product may contain carcinogen, which is known to the State of California to cause Cancer. For more information, go to www.P65Warnings.ca.gov. Special Instructions:1 day rush is available on all in-stock items, one color/one location imprints, and laser engraved orders. About this Plastic 6 Ruler With Magnifying Glass:Plastic 6" Ruler With Magnifying Glass.NOTICE: This item contains required information to be imprinted by federal law. Required information is not optional and may not be removed. We thank you for your understanding.Special Instructions:Rush Service:Catalog Quantities Only.One Color And One Location. About this 4- Way Magnifying Glass:Magnify your brands image with this four way magnifying glass. You can easily make your company name and slogan stand out with this great promotional magnifier. A great trade show giveaway! This is the one when you want a great promotional product that enlarges your brands visibility.Products are not intended for use by children or pets. They may present a choking hazard to children under 3 years of age.Special Instructions:Rush order: Information received after 12 noon Pacific Time will cause the order to move to the next day production. About this Wallet Magnifier With Case:3X Power.Fresnel Lens.Inserts into Clear Case.Ideal for Mailings.Special Instructions:1 Day Rush: 1 color, 1 location. PMS color matches are not available with 1 Day Rush. About this Bookmark Magnifier:3X Power.Fresnel Lens.Flexible.Light Weight.Attached Ribbon.6" English & 15 cm Metric Scales.Perfect for direct mail programs.Special Instructions:1 Day Rush: 1 color, 1 location. PMS color matches are not available with 1 Day Rush. About this Atrium(TM) Silver Magnifier Paperweight:Perfect gift for the home or office.2-piece round Silver finish Zinc Alloy paperweight.Includes 2.5X magnifier and non-skid base.Non-skid base. About this MoMA Page 1 Magnifier + Paperweight:Designed for MoMA by Page Goolrick. Substantial stainless steel and glass 5x magnifier and paperweight. MoMA logo debossed on side. About this Compact Magnifier Light:Bright LED light. 3x magnification power. Powered by 4 replaceable button batteries, inserted. NOTE: Product comes with Prop 65 warning label. Label reads: "WARNING: This product may contain carcinogen, which is known to the State of California to cause Cancer and Reproductive Harm. For more information, go to www.P65Warnings.ca.gov. About this Wallet Magnifier With Case Full Color Digital:3X Power.Fresnel Lens.Inserts into Clear Case.Ideal for Mailings. About this Magnifying Glass:2" lens magnifies 3x.5/8" lens magnifies 6x.Made in USA. About this Crystal Dome Magnifier - Paperweight:Crystal dome Magnifier-Paperweight. About this Oval Magnifier With Light:Let your customers get a bit closer to your brand with this promotional magnifier! Lightweight and portable, this handy, oval shaped 3x power magnifier features a push button activated light for use in low light situations or when lighting is not available. It's great to read small print on prescription bottles, road maps, books, etc.It comes with 4 replaceable LR41 batteries.Material: Plastic.Special Instructions:24 Hour Order :One color/one location imprint only.All additional charges, such as setup and PMS matches apply.No special packaging available on 24 hour service.24 hour orders cannot be combined with other promotions. About this The Detective Magnifier:Fresnel lenses feature 3x magnification and work best when held by hand 2" to 3" from subject. NOTE: Product comes with Prop 65 warning label. Label reads: "WARNING: This product may contain carcinogen, which is known to the State of California to cause cancer, birth defects and other reproductive harm. For more information, go to www.P65Warnings.ca.gov. About this Credit Card Magnifier With Case:Fresnel lenses feature 3x magnification and work best when held by hand 2" to 3" from subject. NOTE: Product comes with Prop 65 warning label. Label reads: "WARNING: This product may contain carcinogen, which is known to the State of California to cause cancer, birth defects and other reproductive harm. For more information, go to www.P65Warnings.ca.gov. About this Bookmark Magnifier, Full Color Digital:3X Power.Fresnel Lens.Flexible,Light Weight.Attached Ribbon.6" English & 15 cm Metric Scales.Perfect for direct mail programs. About this Goodfaire Engineer - Magnifying:Metal magnifier with hexagon prism shaped handle. About this Atrium(TM) Brass Magnifier Paperweight:Elegant way to keep your paperwork securely stacked.2-piece round Brass finish Zinc Alloy paperweight.Includes 2.5X magnifier and non-skid base. About this Magnifier Lens Without Case:Fresnel lenses feature 3x magnification and work best when held by hand 2" to 3" from subject. NOTE: Product comes with Prop 65 warning label. Label reads: "WARNING: This product may contain carcinogen, which is known to the State of California to cause cancer, birth defects and other reproductive harm. For more information, go to www.P65Warnings.ca.gov. About this Credit Card Magnifier With Business Card Carrier Case:Fresnel lenses feature 3x magnification and work best when held by hand 2" to 3" from subject. NOTE: Product comes with Prop 65 warning label. Label reads: "WARNING: This product may contain carcinogen, which is known to the State of California to cause cancer, birth defects and other reproductive harm. For more information, go to www.P65Warnings.ca.gov. About this Wall Street Letter Opener / Magnifier:Combines smooth, slick, stainless-steel cutting action with a 3X, acrylic magnifier. Open your mail and easily read the fine print, too; Material: Styrene body, Acrylic Magnifier. About this Crystal Clear Illuminated Magnifier:Features two magnifying lens.Primary lens magnifies 3x.Supplementary lens magnifies 5x.Two LED lights.Two AA batteries inserted. NOTE: Product comes with Prop 65 warning label. Label reads: "WARNING: This product may contain carcinogen, which is known to the State of California to cause Cancer and Reproductive Harm. For more information, go to www.P65Warnings.ca.gov. Thank you Trudy, Christina and Aubrey! We are happy to read your reviews on our Credit Card Magnifier. Our products are all high quality, and we are glad you could connect that to our promotional credit card magnifier. The Credit Card Magnifier is great for you to see text up close. Help yourself out with this helpful marketing tool. Fresnel Lens with 5X MAGNIFICATION. Individually cello-bagged to prevent scratching. Available in blue, green, red, white, or assorted. Thank you Michele and Anthony! Our magnifying glass is a top hit with our customers. We know that this item is a hot one! The Plastic Lens Black Handle Magnifying Glass is great for educational institutions, museums, police academies for children, and more! The world is your oyster with our promotional Plastic Lens Black Handle Magnifying Glass. Zoom in on a promotional product that's bound to draw in some extra attention for your next business, project or special event! A creative way to promote a new charter school, retail store or retirement community, this 3X magnifiying glass would also be fitting for entertainment venues. Featuring a black handle and plastic lens, these classic magnifiers come packed in an individual poly bag for your convenience. This magnifier is also an eco-friendly product made of recyclable material! Purchase your Lens Black Handle Magnifying Glass today! Thank you Dawn and Margaret! We are very happy to read your reviews. We know this is a great giveaway item at trade shows. Give your customers the business card magnifier that they could carry around at all times. These magnifiers are credit card or business card size to fit in your wallet, purse or pocket. Magnification is 3x for an optimized magnifying glass. Available in blue and white. We have over 100 promotional magnifiers in our selection just for you! You won’t need to search elsewhere for the perfect promotional magnifier. We have different magnifiers available, from credit card magnifiers, business card magnifiers, letter opener magnifiers, to an actual magnifying glass with a compass. All the magnifiers in our selection are all different! Magnifiers are great to see objects or text more close. Don’t get caught squinting to see, get yourself a magnifying glass that will enhance your vision at a whole new level. Don’t let go of this unique marketing product. Use magnifiers to promote your company at all events. Pick the perfect promotional magnifier that will represent your company perfectly. Look through our selection of magnifiers. Shop here! At AnyPromo, we place a high standard on brand impact, just like our customers. Search our site for a wide selection of promotional magnifiers, and see for yourself. Trade show and event guests are bombarded with boring branded swag at every opportunity, so it is extremely important to stand out. Our custom magnifiers are specially priced and proven to generate impressions. Click through our inventory of promotional magnifiers on sale now. Let’s make marketing make cents! Here is a snapshot of our selection of 120 custom magnifier choices. We’re ready to help expedite your order, so give us a call! 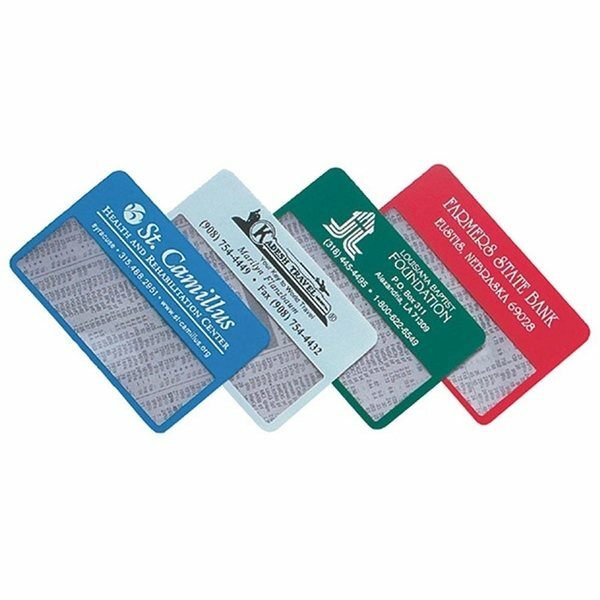 Grab your promo magnifier spec samples today! Magnifiers are a great promotional product to use for your next event! In our selection, you could find the best one that suits your company’s message. Exhibiting at a trade show? We have you covered with our business card magnifier and 3-in-1 letter opener with magnifier. Our options are endless for you to select the perfect promotional magnifier. Our featured list of promotional magnifiers consist of all different promotional items. Whether it’s a 2-in-1 or 3-in-1, we have them available. Give a unique promotional product at your next event!